Now that the conservatory is finished Sarah and I would like to express our appreciation of the work that has been done. Back in the summer when we decided we would like to build, we had no idea who to go to and no local friends to make recommendations. We looked on the internet using words such as “bespoke, quality and individual” By chance we came across Kingsholme and then of course met with you. We said that we did not wish to be involved with any sub contractors but that the entire job should be project managed by you. We also made it clear that we wanted a firm price for the job which would not change unless we altered the brief. You delivered on both counts. From day one of the ground works until the final finishing touches were made recently all the people representing Kingsholme have been excellent. Skilled tidy workers, always polite and a pleasure to have around. Whilst the job was not always straightforward, i.e. the guttering which had to be specially made, there was no question of you cutting corners or compromising your quality standards. We are delighted with the final result and especially pleased that we selected your company. Many thanks to all the team and particularly you Mark. The initial contact with Kingsholme and the professionalism of the product presentation singled Kingsholme out above other companies considered. Although not the cheapest quotation we received, it was the one that gave us the greatest confidence. Without a doubt the product was the highest quality we had seen. The after sales service certainly matched the initial impressions of the company. The conservatory was meticulously constructed throughout (despite typically British summer weather). The finished product is everything we had hoped for. The whole process from our initial meeting with you through to works on site through to completion was undertaken in an extremely professional manner, resulting in an excellent conservatory design, a standard of work that is first class and undertaken by friendly/helpful operatives. The attention to detail was evident at all time. The co-ordination of the different work disciplines was particularly impressive with the general disruption during construction kept to an absolute minimum and the site being keep clean and tidy throughout the course of the works. Michelle and I wish to express our appreciation for the service provided by you/your company and cannot recommend you highly enough. The entire design and construction process was considerably simplified thanks to Mark’s involvement and creativity. Being able to have contact so readily with “the boss” is very rare and very positive. Everyone involved in the construction was efficient, resourceful, helpful and friendly. There seemed to be no problem which Dave couldn’t solve, even unrelated ones. Although it may not be relevant, we must mention how much we enjoyed our conversations with all the workforce. 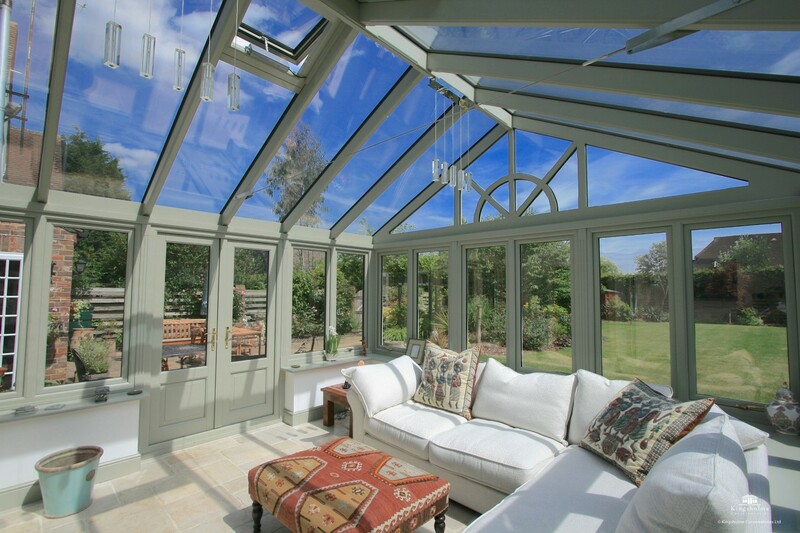 In short, we unreservedly recommend Kingsholme Conservatories as a highly competent company, offering excellent service and value for money, with whom it has been a pleasure to deal. The whole experience from start to finish was very pleasant and professional. There was no pressure or haggling on prices, this was in total contrast to other propective suppliers. Mark gave us some excellent design suggestions. The overall quality of workmanship was also first rate. We have been very happy with the service provided, please keep up the good work! Very pleased with general workmanship and helpful construction staff. Would be pleased to recommend your company to other people. Greatly appreciated Mark’s design of conservatory, blends in well with rear of house. Thank you for making it a relatively easy experience for us! As mentioned to you previously, we are very pleased with the results. We are really pleased with the conservatory and we will certainly recommend you. We are very pleased with the final product, which looks excellent. Mark’s approach throughout was honest and helpful, in direct contrast to the many other sales people from other companies who were clearly only interested in securing the sale. I would like to take the opportunity to thank you for all your help, assistance and understanding. It has been a pleasure dealing with you and we are delighted with the end result. If you wish to use us as a reference we would be more than happy to recommend you/ Kingsholme to prospective clients. Excellent throughout; friendly, courteous employees. Good to your word regarding all aspects of the build. Thanks for a good job – we are very happy with the end result. I’m very happy with the quality of work and materials, the finished conservatory is exactly what I wanted. I would be happy to recommend Kingsholme or provide a reference site. My conservatory is much admired by all who see it and they comment on the high quality of the result. For me it is a daily joy. My thanks to you and I shall certainly recommend your company. We are delighted with our orangery, thank you for all your hard work. Thanks again to you and all the team for your efforts, we are exceptionally happy with the end result, it has truly made a big improvement to our living space and we look forward to spending some quality time in the new garden room for many years to come. Many thanks to Mark for his professional and courteous attention to all matters from planning permission, to the final successful outcome. Many thanks for a super job that has been well done. We are very pleased with our conservatory and would like to thank you and your team for the good workmanship, attention to detail, care and consideration that has been shown to our property and us and would be happy to recommend your company. We would be grateful if you could pass these sentiments on to those involved. Thanks to you, [Mark] Dave and Ian for a great job, the conservatory is all I had hoped for. We were very pleased with your service, and we are delighted with the result. Thank you for all that you have done. Thanks for your help in everything, you have given us a very good service!. A very workable solution to a difficult situation. Mark has been very diligent and has delivered what was proposed. A good job, many thanks. Would not hesitate to recommend Kingsholme to anybody. The job was very much to our satisfaction. Dave (fitter) is a good asset to Kingsholme. Friendly and professional approach adopted by all staff, Dave and Ian demonstrated a particular pride in their work. Very happy with our new conservatory, we would recommend you to others. Builders and glaziers were very professional and tidy, excellent job. Fitters, workmen were all professional, polite and easy to communicate with. They took care to do a good job. We are very pleased with the conservatory and it is how we imagined it would be. Our requirements have been met and we are very satisfied with the end product. Good supervision and communication with Mark throughout. Excellent quality of work and people, many thanks! Your staff were all excellent workers and very helpful. I am delighted with my new conservatory, which though small, does greatly enhance our living space. We are very pleased with the conservatory and will have no hesitation in recommending you to all who admire it. We have already recommended you to two other people, both of whom are having conservatories built by you. All the workmen were pleasant and polite, and got on well with the job. We are really pleased with the end result, and would have no hesitation in recommending you to anymore of our friends who are thinking of having a conservatory. We are very pleased with our conservatory and patio, and would recommend Kingsholme to others. I am delighted with my conservatory and had my fist Sunday afternoon tea in it this weekend. We have had lots of compliments on the standard of build, and so far are very pleased with conservatory. We are very pleased with the final result. We would recommend Kingsholme to friends and would use your services again. The workmen were excellent. We have been very impressed by the design and build overall. Seeing the design develop into a finished conservatory has been very satisfying. All involved have been helpful, polite and tidy. Nothing was too much trouble and the level of service was very good. Very good team of builders and installers; always helpful and courteous. We wish to thank you and your team for carrying out a very good job, we are pleased with the result. Overall the work was done to a very professional standard, particularly groundworks, foundations and finish (plastering, flooring, electrics and heating) Care was taken to keep things tidy and to clean up afterwards. Very satisfactory!